These Limited Edition secateurs are special in all sorts of ways - they're forged from Hitachi YCS-3 carbon steel, a premium, hard wearing steel that retains its edge well and sharpens easily. 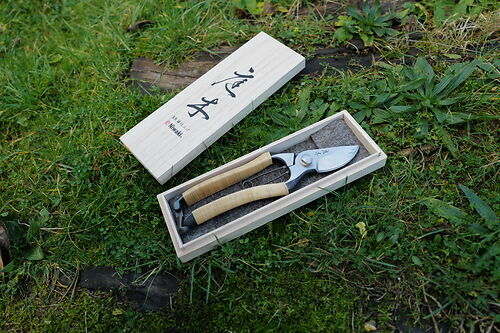 The S-Type design is a combination of the two traditional Japanese secateur designs, A and B Types, offering perfect ergonomics of grip and balance for long use. Handles are wrapped with varnished Wisteria rattan, that not only looks amazing but also provides a natural, texture grip that feels great in the hand. Limited production batch of just 280 pieces - they come served up in a kiribako Paulownia wood box (yes - the one with the big leaves!) and make a most excellent gift. As a natural material, rattan should be treated a step more carefully than our regular secateurs - not bashed about, not left out in the rain overnight (not a good idea, for any tools, incidentally...) and generally looked after. In particular, don't fold the secateur lock catch inside the handle, as this can wear the rattan. Niwaki Tip: Clean regularly with the Crean Mate and Camellia Oil.